This project was created on 03/23/2016 and last updated 3 years ago. Open Source, Open Hardware, Low Cost, Easy! The project is based on a client-server structure, where you have a single server (In Raspberry Pi 2) and clients are the doors. As a client can stay a Raspberry Pi or ESP8266 Wifi. Clients connect to wifi and establish communication through a REST API made with Django and Django REST framework that is in the server. As it is a very delicate service the idea is not to have the server on the Internet but in the local area. The system creates a URL with the tag received by the reader and asks the server. Checks whether the tag has a user and if you have access permissions (as can be if the current monthly payments) to activate the relay which opens the door. The system has stored users, which can be assigned different access tag. As for areas where there are partners, you can specify whether the user is aware of your payments on time to access. When entering or leaving a log is saved with the date and time. It has integration with bot telegram that you can ask if the space is open or closed, which users inside or in the future, open the door or integrate other sensors IOT. 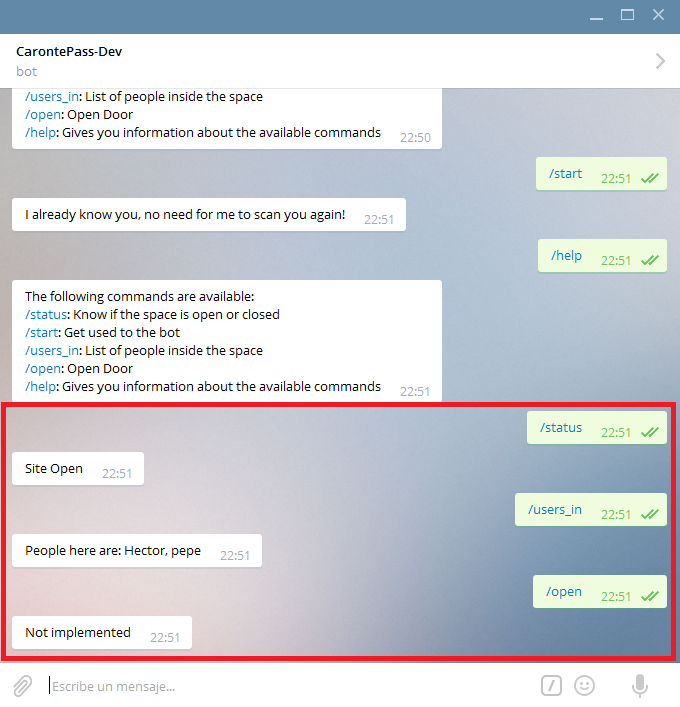 From telegram sends an open or closed to a group telegram to your users know when entering and leaving the last user site. Also send a personalized message to each user to enter or leave the space. This is important for a reader on the side of the entrance door and another on the side of the exit. Here you can find everything you need for mounting hardware part of clients (doors). Here&apos;s how it works now, now asks username and password to access the info. But I&apos;m already working on a version with access token and under https. By raising the project I thought many ways to do it, but the scalability thinking I was left with the option of that clients (doors) to be as "dumb / simple" possible. To achieve this required a part of the powerful server, so I chose Django and ... How to have N doors? How to make it cheaper-single doors possible? The easy thing would have been to put a guy Raspberry Pi computer-door, but that was not what I wanted (if it was the easiest). The best option I found was to make an API, which could use different technologies to clients but to run only need an Internet connection to make inquiries. The client (a door) NFC reader reads and gets the tag. That tag puts it in "code" and makes the previous request. The server parses the url, receives the "code" and searches the table of "devices" where all tag IDs are stored. The tag is an associated usaurio so already has the identidicación. Responds to the request in JSON format, we parser on the client to get the data that interests us. For example, to activate the relay to open the door should be fixed in the "result" field. If the user meets the access requirements will result "True" and the relay will be activated. Now security is not the maximum possible from my point of view, so I&apos;m studying how to implement HTTPS. The project leaves open the possibility to add different forms of access. I edit the database by adding a table related to the user and the Chatid field that is used by Telegram to identify users. Improved Admin to see the table Telegram and created the "message_detect_tag" class in the models to detect if the user enters or leaves the space and thus send a personalized greeting or farewell. This message system is independent of bots Telegram to fall if continue to send these "simple" messages. Also warns a group of Telegram when the first user (Site Open) enters or exits the last (Closed Site). Add the Bot Telegram, programmed in python using the TelegramBotApi. Know if the space is open or closed by the command "/status". Return a list of users who are within the space at that moment in the command "/users_in". (Coming soon) Option to open the doors using the command "/open" to persons authorized to do this. Can you think of a new option? Today I want to show the "engine" of the project management section Django. In it you can manage everything related to user management (personal data), user fees, the tags with which they can access the space, the table chatid of Telegram, system messages and access logs ( logs). It also allows the creation of groups and give special permissions to users, but this for later, so that the member of a group to be allowed access to a restricted space to rest. Then we will see each section separately to have more detail the operation of the system. Devices: Devices that can be accessed. There may be several types and number per person. System Logs: View a record with dates of inputs and outputs of users. See also allows simple so that users are in space at that time. Messages: Topic to manage messages. These can be of various types. When entering or leaving a user searches for a message of that type (input or ouput) and sent it by Telegram, it is a good way to surprise with the user every time you pass your tag to enter or exit. He also writes a group of Telegram when entering the first or the last saying out if the site is closed or open. Payments: As spaces is very crowded, usually have partners who have monthly fees. This is a way to control salt in if the user is aware of your payments. Telegram: This table is used to store chatid providing users if they want to receive personalized messages. In the future it will also serve to give physical access to space just write "/ open" to the bot Telergam. Hello, is it some instruction for how to install software on raspberry side? Do you have a link or specific model no for the RC522 (RFID and NFC lector) ? I&apos;m trying to build a system for our local maker space. Hi! You can use any rfid-rc522 model, get the cheapest from Aliexpress or Ebay. If you have any question you can open a issues in the github of the project. You are about to report the project "CarontePass: Open Access Control", please tell us the reason.